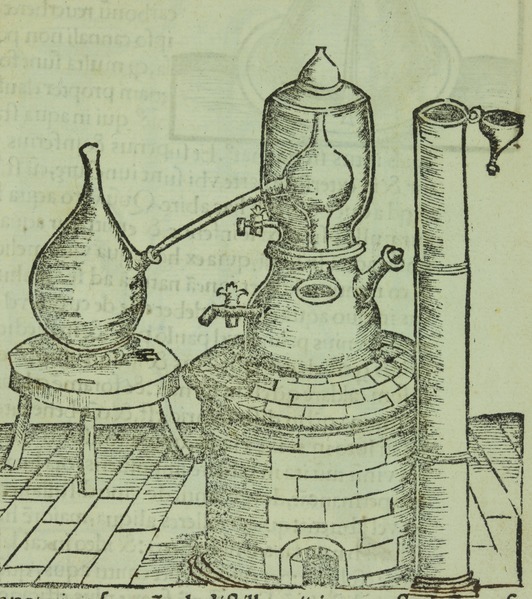 Session Eight of the Jung Platform’s online class on James Hillman’s book, “Alchemical Psychology,” moves the work from forge to stove, in which the use of glass vessels for heating the material make alchemy both possible and psychological. Through its properties glass shapes, forms and colors the perception of the materials. Pat and Robbie liken language to glass, which I find very satisfying. When the medium of language loses its transparency, words can be mistaken for the thing they refer to. 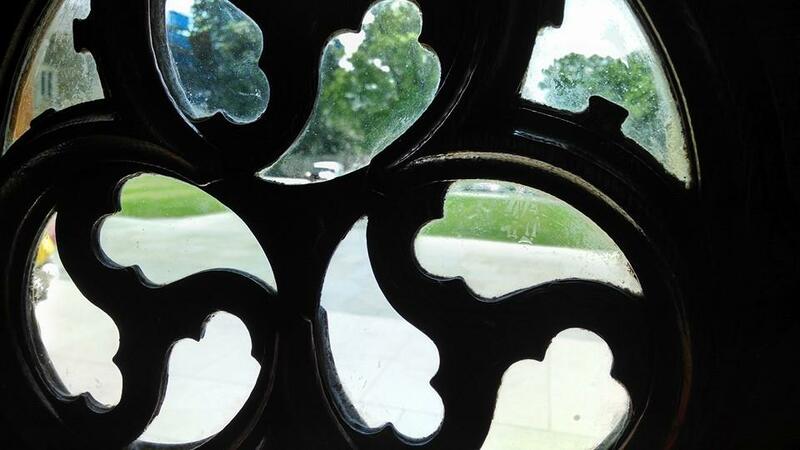 Glass allows us to be present to the material, “an inside view,” as Robbie calls it. But glass also contains – according to its own structure, presenting bite-sized, specific, particularizations of the material. Containing the material allows us to work on the particulars rather than generalizations. Vulnerable to a build-up of sediment from the materials within, glass may lose its clarity, just as our habits, theories or preconceived ideas create a film through which we see the material. Part of the work, Robbie reminds us, is to keep the glass vessel clean, especially as we move from one aspect of the work to another. I wonder if we are not distancing ourselves from the subtle qualities of things through mass production – from the food that we eat to the instruments used for everyday tasks; do we now risk losing the ability to notice the subtlety of substance – glossing over properties, only to increase our focus on defect of functionality? I’ll be the first to complain about poorer quality of tools and many mass-produced things we’ve come to rely on. Through their use we lose not only the skill in making them, but a familiarity and respect for the material world that can come only from working directly with the substances. Sophistication, Robbie notes, is refinement; returning again and again to the same material to see deeper into its properties. The difficulties that the material presents to us, which Robbie likens to any work that we do: dancing, painting, writing, speaking, or day-to-day problems, require going back over the material to refine and discipline the work. The refinement can also move literal meaning into poetic metaphor, lifting a more subtle sense of meaning out of the mundane. Essentially a double boiler, the Bain Marie, a vessel thought to be of Egyptian origin, heats the materials with hot steamy air, warmed by water, heated on a stove. The Bain Marie allows fire and water, two notorious enemies, to cooperate. Slow and gradual heating allows for the material never to over heat as long as an ample supply of water is provided. A slow, gradual increase of temperature changes solids to liquids, breaking down the materials, and in adding to them, re-thickens, as in the making of sauces. Blending, rearranging the materials can put substances into new relationships with each other thereby creating something new. 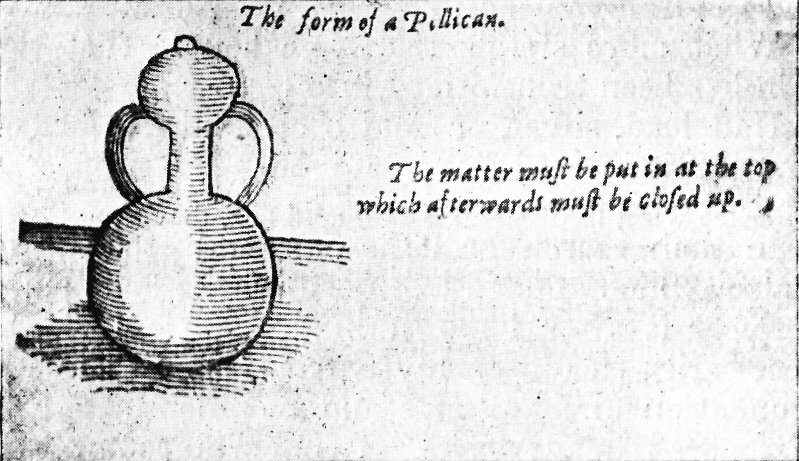 The pelican, a glass vessel tightly enclosing the material, recirculates from bottom to top, performing an alchemical operation called iteration or repetition. The work inside the pelican is vital to alchemical psychology. Here is where both body and head are fed by shared images through containment and repetition. Feeding the body what is going on in psyche makes ideas matter. Feeding the head what the body feels psychologizes the body into metaphor. Robbie suggests that the pelican, its shape and form, is itself refined much as our body is by the work happening within the pelican. The temptation here might be to release the refined insights from the top, or head, to enjoy a brief exhilaration at the expense of the iteration necessary for the work. “Hence the term “Pelican,” since that bird, according to lore, drove its bill into its own breast to draw the blood that fed its young. Christ was this pelican, nurturing his faithful with his own life-blood. The pelican is thus a wounding, a repetitive ritual, a sacrifice, and a humiliation all at once. And, a necessary instrument for feeding the opus from within itself. Here we see the importance of containment and repetition in the work, a need for privacy, to stew in our own juices before a creative work can be brought to fruition – something that can only be done when we admit to ourselves the necessity of the work, letting go of any desire for approval or progress. As Pat says, the realization that we are in a system, in process, is what makes the work alchemical. All quotes from Hillman, James (2011-10-10). Alchemical Psychology (Uniform Edition of the Writings of James Hillman). Spring Publications, Inc.. Kindle Edition. Had to get caught up on the classed notes that I missed :). Thank you for taking the time to share these Debra. I think alchemical psychology is quite a fascinating subject and Hillman provides invaluable insight into how it relates to the our experience of life, reality, or whatever word we may use to describe the time between the first and final breaths. Great series! You’re very welcome! I am glad you are enjoying the series. The class has been fascinating and to think that in ten sessions we only finished the first chapter! I so appreciate you and all who have taken the time to comment. It’s a bit of work to do the writing, but I must say, the writing brings me closer to the material too. “The iteration of the work.” The re-distilling it in the pelican, enriching life, giving it over. This rings so true! I am very much enjoying your class notes. Would you be so kind to have a page or post that links all of them for ease of finding them. (It may exist but I am not able to find it :-). Thank you so much. Thank you Debra. Hope you have a wonderful week! “When the medium of language loses its transparency, words can be mistaken for the thing they refer to.” So much to ponder here! Thank you!